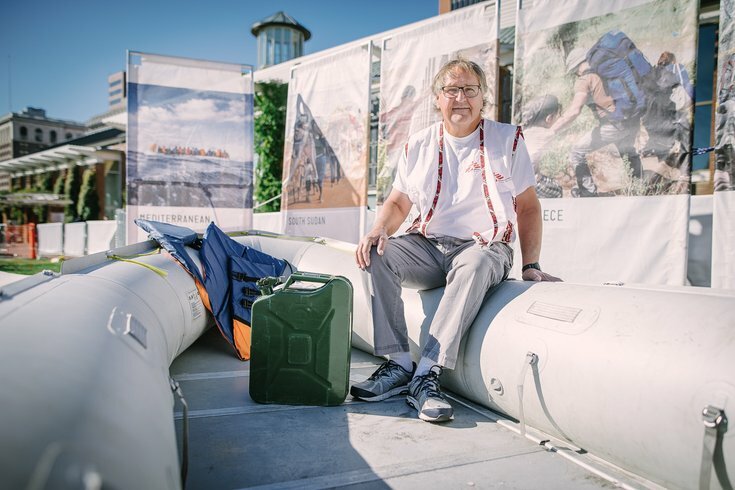 Chip Hunter, project coordinator with Doctors Without Borders, sits inside of a model refugee boat in the "Forced From Home" exhibit on Saturday, Nov. 5, 2016. Refugees are “Forced From Home,” the name of an exhibit by Doctors Without Borders which seeks to illustrate the reality, free of political rhetoric. The free exhibit by the international medical humanitarian group displayed on Independence Mall runs until Nov. 13. It runs from 9 a.m. until 3:30 each day. Jason Cone, the United States’ leader of Médecins Sans Frontières, or MSF, as the organization is known in the rest of the world, opened the exhibit Saturday following visits to five other Northeast cities this fall. Based on his own visits to a number of far-flung locations, Cone said the motivations of most refugees “are not much different than any of us. They are mothers and fathers wanting the best possible future for their children. “They are from far from passive victims. They are some of the bravest and most resilient individuals on earth,” said Cone, adding the exhibit is meant to put a human face on what is otherwise just hard to fathom statistics. The exhibit is suggested for children above the age of 12. 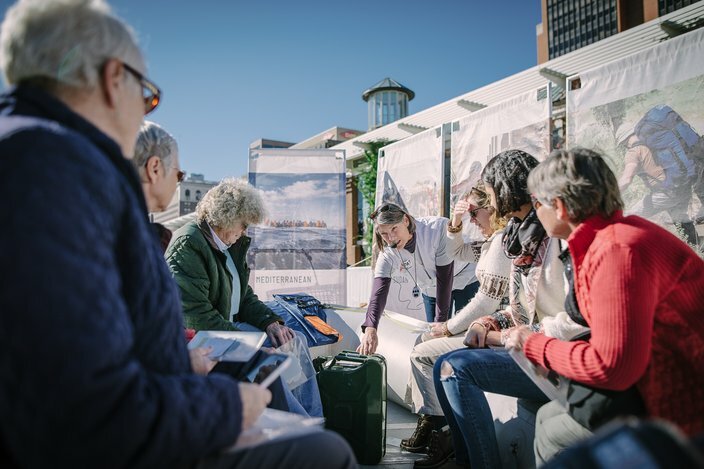 Exhibit attendees sit in a model refugee boat as a tour guide discusses the dangerous conditions of overloaded rafts on treacherous waters in Independence Mall on Saturday, Nov. 5, 2016. The stats surrounding the displaced are staggering. Currently 65.3 million individuals are displaced, an increase of 5.8 million above the previous year, according to MSF. The majority are displaced within their own countries – 40.8 million. Another 21.3 million are refugees who have fled their borders. And just 3.2 million are seeking asylum, seeking legal protections and material assistance, according to MSF. Cone said it is the worst displacement of people since WWII. The organization said 50 percent of the refugees are less than 18 years old. The majority of the displaced end up in developing and mid-size countries, said Cone, not in developed nations, including the United States. Last year MSF oversaw 446 projects in 69 countries, using 34,000 staff members. The hardest hit locations currently are Iraq, with internal displacements and Syrian refugees, Lebanon due to the crises in nearby Syria, Mexico due to refugees from Central American countries, particularly Honduras and El Salvador, South Sudan, where there is a raging civil war, and in Tanzania, where Burundian and Congolese refugees have swarmed. Cone said sharing the stories of the people they have come to know is the point of the exhibit, which avoids politics and the fraught questions of resettlement. Trained in Philadelphia as an obstetrician and gynecologist, Dr. Africa Stewart explained how she came to join the organization when her own child was just 18 months old and go to Sudan. Chip Hunter, 61, a psychologist and retired university professor, has seen the reality of refugees up close in a number of locations. He began with short volunteer stints with the group, but now he works full-time as a project leader and therapist. His wife also works for the group. They’ve only been assigned out together once, so they have covered lots of ground. Even years later, many refugees hope to return home, said Hunter, which is why so many of them take and retain keys for homes that are no longer standing. He also said a large number of the staff are themselves former refugees. The mother left her three-year old “in God’s hands” by the side of the road because the child could not keep up and the mother could not carry all three children to the relative safety of a refugee camp. Hunter deploys around the world from Geneva. The Swiss city is one of five operations centers in Europe which MSF uses for staging its missions. 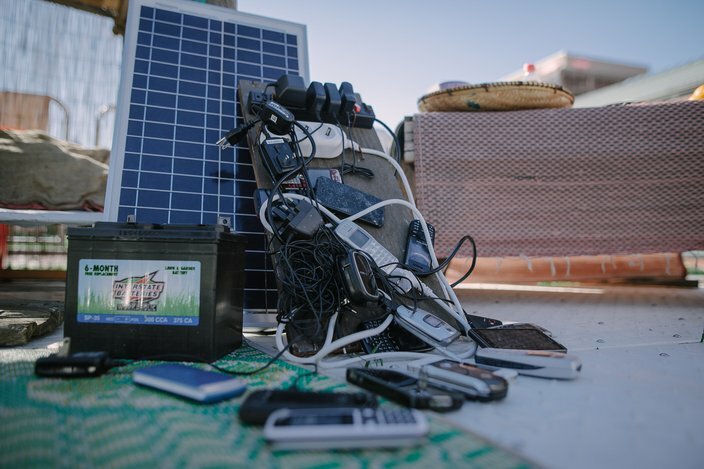 A display of refugees' cell phones illustrates a makeshift charging station, in Independence Mall on Saturday, Nov. 5, 2016. He said the first mission for the organization is nearly always assuring a safe water supply and providing sanitary facilities to deal with human waste. In the early stage of a population dislocation, cholera, which is directly related to sanitation, is the biggest killer, said Hunter. Overall, mosquito-borne malaria makes the most people sick, but many recover with treatment. Ebola, though rare, is one of the few diseases that MSF workers cannot be protected from with immunizations, said Hunter. Having deployed repeatedly, the aid group has become quite logistically skilled at addressing most communicable diseases, he said, as well as setting up shelters. Hunter and his wife are amazed at the resiliency of the children they encounter. 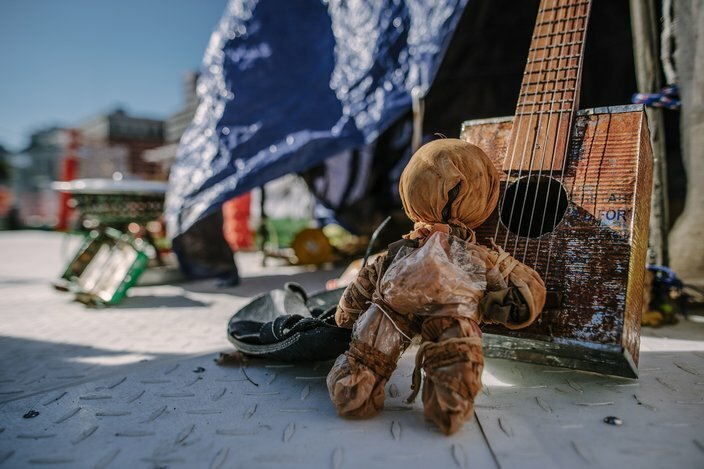 There are two dolls a 12-year-old child fashioned from plastic bags and scraps of cloth while in a Tanzaninian refugee camp that are on display at Independence Mall. A makeshift doll, made of plastic bags and debris, common among the children of Burundian refugees in Tanzania, sits on an improvised guitar in Independence Mall on Saturday, Nov. 5, 2016. There are also toy vehicles made from milk bottles and a guitar made from a cigar box. Often a home-made toy is a child’s only personal possession in the refugee camps, said Hunter. Elizabeth and Sean Benjamin of Hainesport in South Jersey have casually supported the group annually for the past two years. They intend to kick up their support after seeing the interactive exhibit on Saturday. “It is one thing to see images and bits of news about people in circumstances beyond their control. But this is a whole new level,” said Sean Benjamin. The couple said they intend to increase their support for MSF as a result of seeing the exhibit.